Everyone inherits autosomal DNA from their parents: 50% from each parent, which contains a random mix of DNA segments from their parents, their parents, their parents, back for several more generations. The wonderful feature of autosomal DNA is that it can be inherited from all lines of your pedigree, not just the direct paternal or maternal lines. Anyone can test their autosomal DNA - any age, any gender - and it is quick and easy to do, via a cheek swab or saliva sample. Any one of your ancestors in the pedigree chart below could have passed some of their DNA onto you, and to other descendants as well, even quite distant cousins. If both you and other descendants of the same ancestors test with the same company, and share a minimim-sized segment of DNA in common, you should show up in each other's list of matches. Consider that even if you only go back six generations - to your 4th great grandparents as in the chart above - depending on how many surviving children each couple had, you could potentially have tens of thousands of 5th cousins. Not all of your distant cousins will be detected as matches to you. Sources: Family Tree DNA and 23andMe and AncestryDNA. Each parent can only pass down half of their autosomal DNA to each child, so each child will get a random mix of segments from their parents, and consequently a random mix from each grandparent. The diagram below demonstrates how the DNA can be recombined at each successive generation. Three children of the same parents can get quite different mixes of DNA from their grandparents, which means they will match relatives and cousins slightly differently. For 3rd cousins and further back, some of your tested cousins will be detected as matches to some siblings, and not detected by other siblings. Testing siblings is a very good idea to get DNA matches with a wider selection of cousins. If you don't match a 3rd cousin as expected, test one of your siblings or your cousin's siblings, as they might match each other. Your genetic genealogy project will progress rapidly once you test some known cousins and/or confirm new cousins, as being able to identify your most recent common ancestors helps you isolate those lines you share with other matches in common. It is also highly recommended to test older generations, if possible, as their DNA will be less diluted than the younger generations. Testing their DNA can also help isolate your other matches to your shared branches. If you are young enough to still have grandparents, great aunts, great uncles, or cousins of your grandparents, you are very lucky and would be wise to test them while you still can (DNA tests for birthday presents are a great idea!). Relationships are estimated based on the percentage of shared DNA, eg. 50% for a parent, child or sibling; 25% for a grandparent/grandchild, aunt/uncle, half-sibling, niece/nephew; 12.5% for a great-grandparent, 1st cousin, great aunt/uncle; 6.25% another generation removed, etc. The International Society of Genetic Geneaogy (ISOGG) Wiki contains some useful charts for estimating autosomal DNA matches based on the percentage of DNA shared, or the measure/quality of the segment shared (in centiMorgans - cM). 23andMe also publishes a table showing relationship percentages (without cMs). Autosomal DNA testing does not 'find or identify' relatives as such, but matches testers with other people who have also tested with the same company. It is purely a matching system - the more people that test, the more matches everyone gets, including with previously unknown cousins. It is a big puzzle... you are given the clues which are the genetic relatives, and you have to use your genealogical research skills to find the records and evidence to connect them. Traditional 'paternity testing' tests two specific individuals and compares a very small number of unique markers to see if they matched each other. If not, the process is repeated with two new candidates (if any are available), and often at a significant cost. With genealogical DNA testing, approximately 700,000 markers are tested and compared with those of hundreds of thousands of other people in the database. Testers are given a list of people who share DNA with them, with the closest predicted relatives at the top of their match list. It is impossible to know before testing if you will get any close matches. Australians and New Zealanders with British & Irish origins tend to start with a selection of 2nd-4th cousins at the top of their match lists (FTDNA's Family Finder), but some people can get closer matches - it all depends on which of their relatives have already tested. If the person you are testing is an adoptee, donor conceived, a foundling, or has unknown parentage for whatever reason, it is recommended that they test with all three of the genealogy DNA testing companies, to get their DNA into all three databases to have the best chance of matching with others (in case the person they want to match with has tested at a different company). Testers at any of the three companies can also upload a copy of their raw data (results) to a free site called GEDmatch.com, where they can be compared with others who have tested at other companies and also uploaded their results. GEDmatch is not a replacement for testing at all three companies, as only a small proportion of testers from each company upload their results, but it is a great site with a wide range of useful tools. 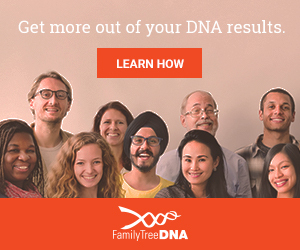 How do I get an autosomal DNA test? Simply order an autosomal DNA kit online from Family Tree DNA, 23andMe or AncestryDNA (or all three). Refer to Which DNA testing company should I use? for a comparison of the features and current prices of autosomal tests at the three companies. Your kit will arrive in the mail, is very simple to do, you post it back to the US in the pre-addressed mailer, and your results and matches will be released in your online account when they are ready.